Like Cinderella, cauliflower has transformed into the belle of the ball. Once a bland side dish, it has recently taken its place at the center of the plate, thanks to creative chefs who recognize its versatility. These days you’ll find it fried like chips, stuffed in pasta, whipped into custard, and served as steak. Here are some of the most interesting and appealing, not to mention unusual delicious cauliflower dishes around. The menu at Glen Ellen Star changes every month or so in order to focus on what’s in season. Chef and owner Ari Weiswasser recently added cauliflower-stuffed pasta to the offerings as a vegetarian main course. 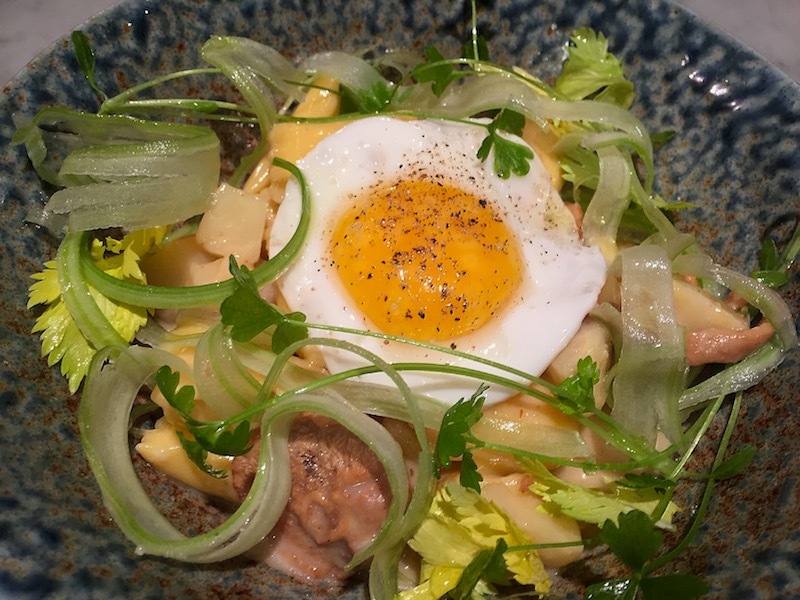 A stunning dish, it’s served with salt-baked celery root and hedgehog mushrooms and topped with a hen egg. Make a reservation at Glen Ellen Star. 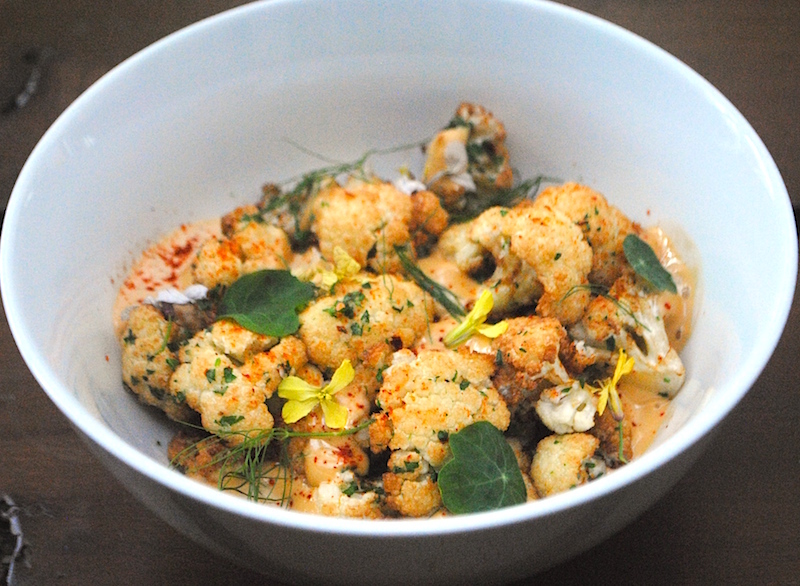 Executive chef Julio Peraza takes the oft-neglected parts of the cauliflower and turns them into something special. The stalks and florets are caramelized, and then the brilliantly colored florets are fried in a mixture of red wine vinegar, white truffle oil, salt, and pepper to give the dish an extra dimension of flavor and bread crumbs provide a crunchy texture. It’s then topped with stracciatella cheese, a soft and creamy cheese that resembles the center of burrata. Make a reservation at Proof + Pantry. At newly opened The Perennial, chef Chris Kuniya uses all parts of the cauliflower — sometimes even the leaves. 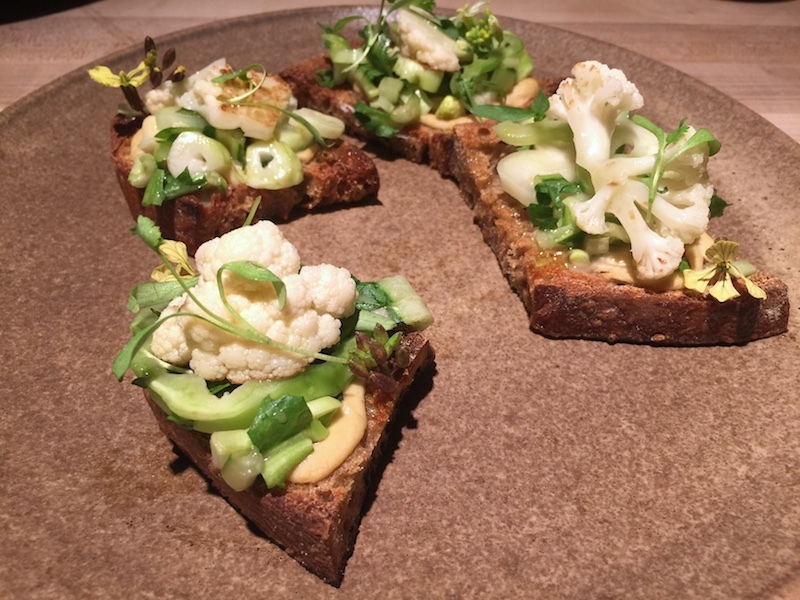 The stems are incorporated into a whey and cauliflower spread and the florets are charred and then pickled in Champagne vinegar and served atop crostini. The dressing changes frequently; sometimes it’s made with the leafy green puntarelle, other times with fermented mushroom water, fermented mushroom stock, fresh mushroom broth, and extra virgin olive oil. Make a reservation at The Perennial. 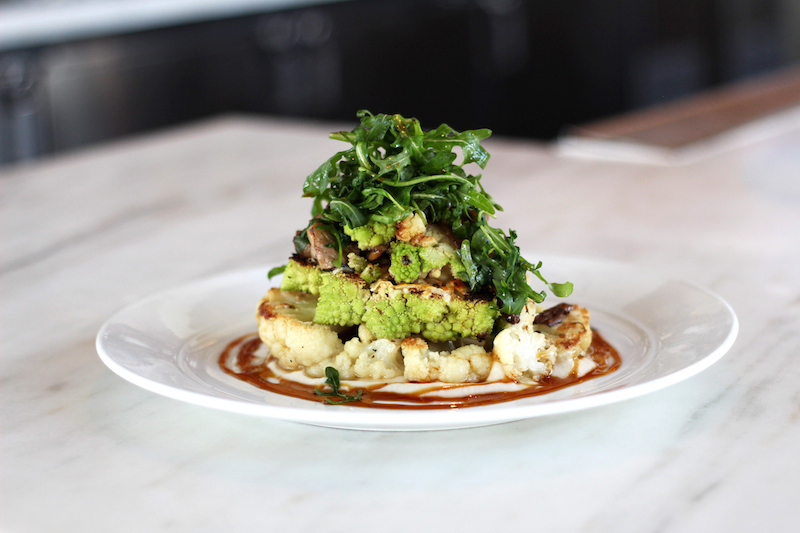 At Andiron Steak & Sea, located in downtown Summerlin, chef Kim Canteenwalla roasts cauliflower, topping it with pale green romanesco, which has a similar texture to cauliflower, along with trumpet mushrooms, Manchego cheese, and a garnish of dressed arugula. It’s presented in a most dramatic way and is the perfect entrée for someone not quite in either a steak or sea mood. Make a reservation at Andiron Steak & Sea. RN74 is known for it’s innovative presentation of its wine list on a board that resembles a train schedule as well as rich and indulgent dishes including foie gras, bone marrow, crab rillettes, and lobster thermidor. Even cauliflower gets a luxurious treatment here. Chef Michael Lee Rafidi serves it fried with uni aioli, duck fat bread crumbs, and chili flakes. Make a reservation at RN74. At the Indian Springs Resort, Sam’s Social Club offers a mix of classic comfort food like deviled eggs and cheeseburgers along with more sophisticated fare. 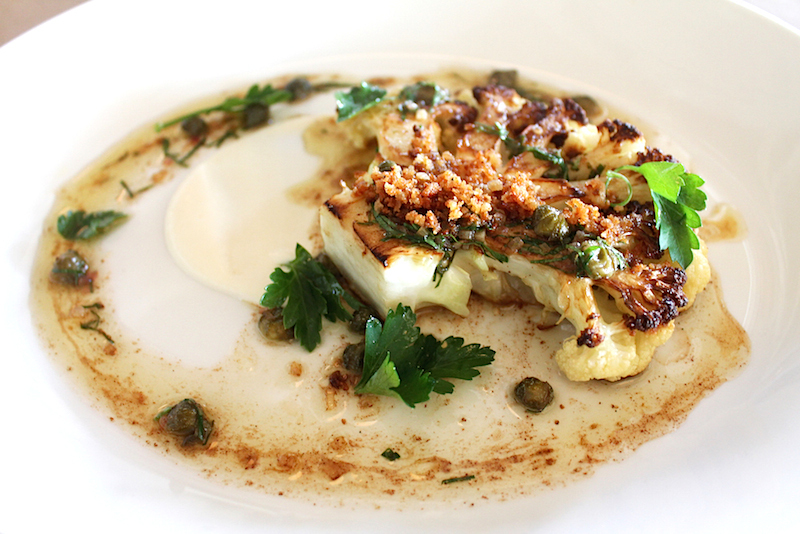 The vegetarian entrée of cauliflower steak is a showstopper offering a riot of flavors and contrasting textures. 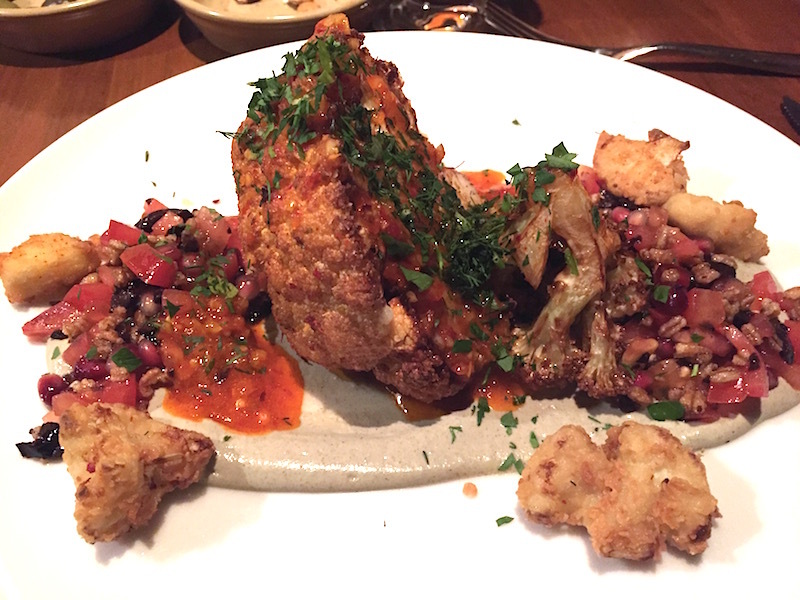 Cauliflower is served both lightly fried and roasted and comes with a sauce of charred cashew tahini, hot pepper vinaigrette, crunchy puffed farro, olives and juicy pomegranate and tomato. Make a reservation at Sam’s Social Club. 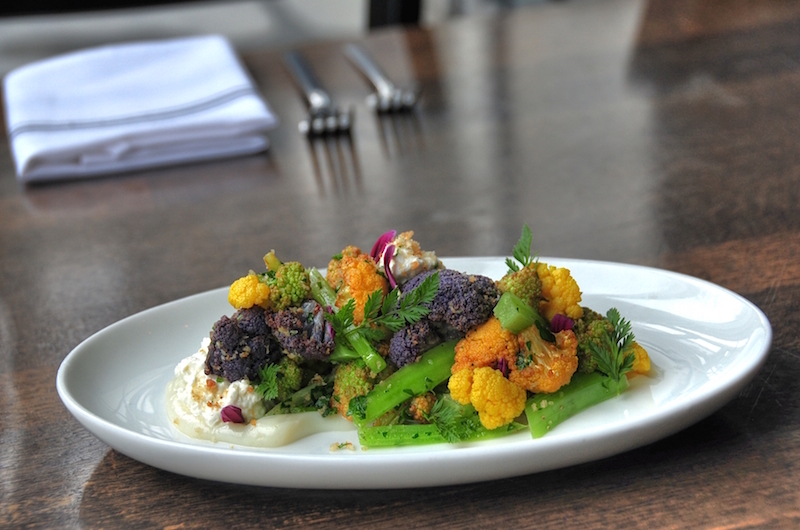 Cauliflower is served as an impressive starter at this rustic cafe. Cauliflower heads are cut into slabs and pan seared. Although the accompanying Grenobloise sauce, which takes its name from a city in the Southeastern part of France and is prepared with brown butter, capers, flat leaf parsley, and lemon segments and zest, is most frequently served with fish, it brings out the best in this Brassica-centric dish. Make a reservation at Mayfield Bakery & Café. Executive chef Sean Fowler likes to stick to a no-waste policy in the kitchen whenever possible, which has led him to use cauliflower stems in a particularly ingenious way. 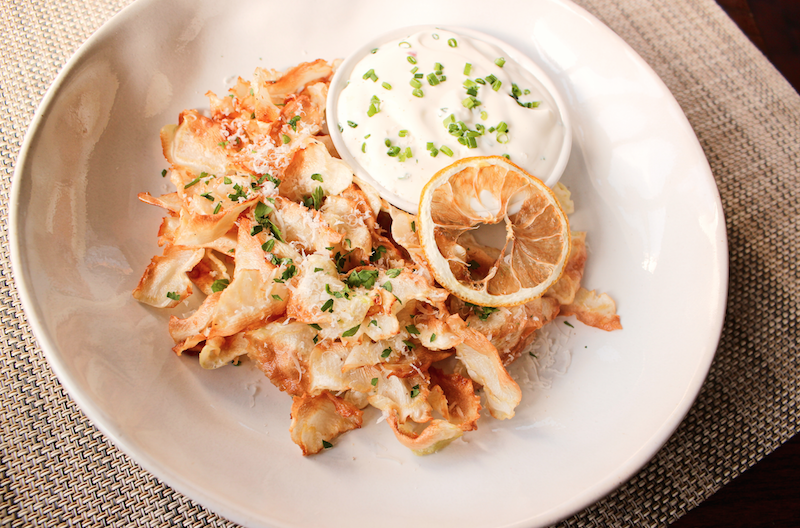 He slices the stems paper-thin and fries them to make light and delicate chips that are both crunchy and full of flavor. Served with Parmesan, lemon dust, and a ramp-buttermilk dip, they make for an ideal bar snack or side dish. Make a reservation at Mandolin. Chef Nicolas Delaroque invents a new menu every day for his eponymous restaurant Nico. 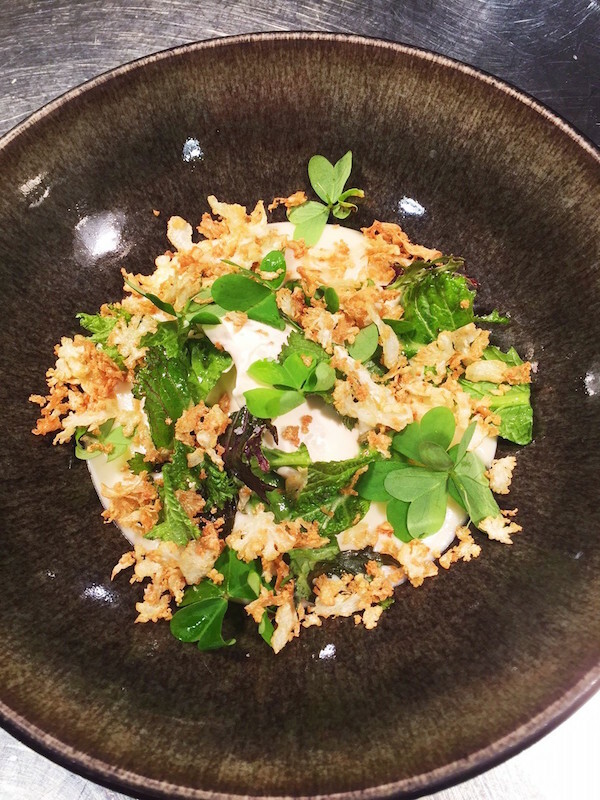 His repertoire of winter dishes includes quite a few interpretations of cauliflower including a particularly beautifully plated cauliflower soup, which features crispy cauliflower, hay creme, mustard greens, and sorrel. Make a reservation at Nico. At this classic Italian trattoria located in the heart of downtown Sausalito, executive chef Benjamin Balesteri serves seasonal Italian dishes and is known for specialties like bollito misto and wood-fired and grilled entrees. 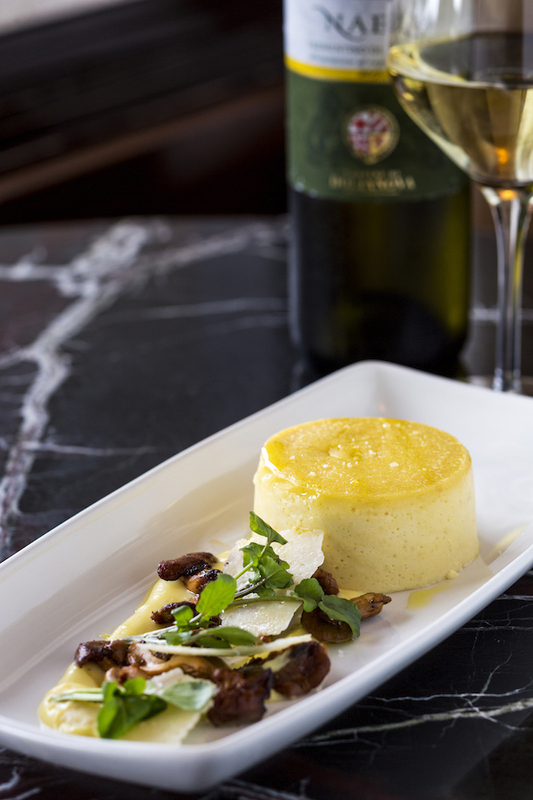 A popular starter is the rich and creamy sformatino, or custard, made from cauliflower with sunchoke puree, chanterelle mushrooms, and Parmigiano. Make a reservation at Poggio. Loca Luna is a lively tapas-style spot that offers up a unique selection of traditional and not-so-traditional tapas in Atlanta’s Midtown neighborhood. 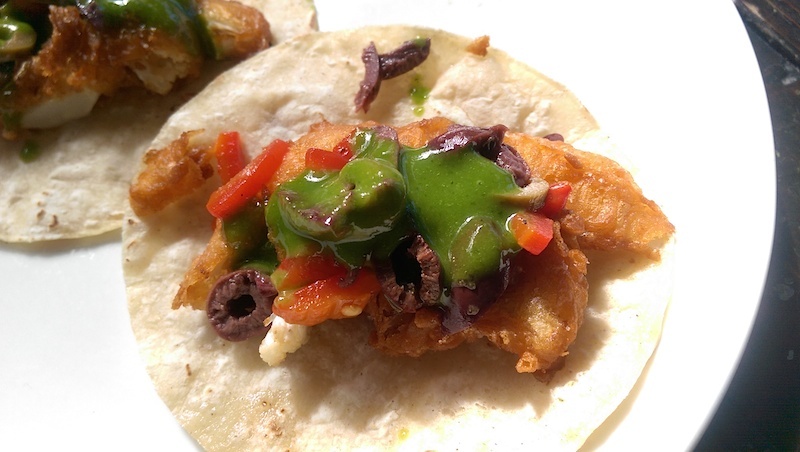 One of the more unusual dishes is executive chef Alexander Herbert’s Fried Cauliflower Taco. It’s served with roasted red peppers, Spanish olives, and cilantro vinaigrette – and you won’t want to share nary a bite. Make a reservation at Loca Luna. Have you tried any of these delicious cauliflower dishes this season? Let us know in the comments here or over on Facebook, G+, Instagram, Pinterest, or Twitter. Photo credits: Tubay Yabut (Poggio Trattoria). Nico Restaurant (Nico).